Kevin Conto received his athletic training degree from the University of Wisconsin- Madison and obtained his Master of Physical Therapy degree from Concordia University. He has his certification in manual therapy from Maitland-Australian Physiotherapy Seminars and is currently a physical therapist at United Hospital System. Kevin works with a variety of patient populations and also specializes in industrial rehabilitation and orthotic fabrication. The market for shoes is vast and with so many selections available, how do you determine which shoe is right for you? Having proper footwear can not only help with protecting the foot but assist with absorbing shock and providing stability as well (1). In the past most people would have simply selected a shoe which fits, feels good, and has previously worked for them. With advances in shoe technology, there may be even more things to consider in the selection process now. The first step to selecting the right shoe is to be aware of your foot type. Foot types can be categorized into three classifications based on the height of the arches in the foot: 1) neutral foot (normal arch) 2) pronated foot (lower arch) and 3) supinated foot (higher arch). A neutral foot allows for neutral pronation and is the most idea foot type as it will allow for the most efficient type of gait. 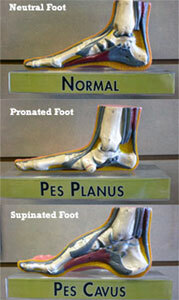 A pronated foot usually results in the arches falling when the ankle rolls inward through the loading phase in gait. A supinated foot, on the other hand, will not roll far enough inwards through the loading phase which results in limited motion at the arches through the gait cycle. By knowing your foot type, this will allow for better understanding of why a shoe is constructed in a certain manner and will also assist with determining which shoe would be most appropriate. The next step for shoe selection is to have a better understanding of the anatomy of a shoe. Shoes come in various shapes and sizes and are constructed with various materials. Having a better understanding of the anatomy and construction of a shoe will not only help with shoe selection but will assist with increasing comfort and minimizing injury as well. Below is a review of some of the important aspects in the construction of a shoe which will assist with providing additional guidance with shoe selection. If you remove the insole of your shoe you should be able to see the last of the shoe and how it is constructed. The last is the critical element in footwear construction that determines the shoe's shape, size, inner volume, fit, style, and specific stress points during locomotion (2). The last of a shoe can be constructed in three ways. 1) A shoe constructed with a cardboard last is more stable and more suitable for individuals with flat feet. 2) A shoe constructed with a combination last has cardboard in the rear half and a stitched seam in the front half which allows it to be more flexible than a cardboard last and more stable than a slip last. 3) A shoe constructed with a slip last has a stitched seam which is less stable and more suitable for individuals with high arches (3). When you inspect the last you should also examine its shape. 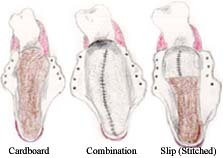 In general there are three main shapes of a last which can accommodate differing foot types.1) A straight last is recommended for individuals who have flat feet or have a tendency to over pronate. 2) A semi-curved last is recommended for individuals with normal arches and 3) a curved last is recommended for individuals who have high arches or have a tendency to over supinate (3). 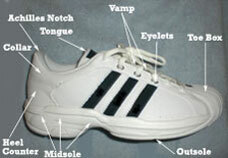 The upper is the top part of the shoe and is composed of the toe box, vamp, tongue, laces and heel counter. The toe box and vamp provide protection to the forefoot and toes. If the toe box is small this can result in irritation or injury to the toes and nails (4). The tongue and laces assist with proper fit and upper foot cushioning while the heel counter plays a key role with stabilization of the rearfoot (4). The heel counter can be constructed with chemical sheets or thermoplastic. Heel counters which are constructed with thermoplastics are more firm and will be able to provide more support. The midsole is where the technology is for the shoe and assists with shock absorption. This is where many shoe manufacturer’s focus their research and development on. The midsoles of shoes are usually constructed utilizing ethylene vinyl acetate (EVA), polyurethane or a combination of softer and firmer materials. EVA is a light material which can be compressed but ages and wears out rapidly. Polyurethane, on the other hand, is a denser and more durable material which lasts longer (4). Many shoe manufactures are utilizing a multi-density midsole consisting of a softer material for the lateral side to soften impact and a firmer medial side for support (4). This may be a lot of information to comprehend and may be somewhat confusing. Provided below is a chart that organizes the information which was discussed in this article and will provide some general guidance and recommendations for shoe selection (1,2,3,4). You can also obtain more information on finding the right shoe for you by utilizing the Runner's World - Shoe Advisor. 2. Rossi WA. The neglect of footwear education of podiatry students and practitioners. J Am Podiatry Med Assoc 1987;77:357-362.2. 3. Conto, K. 2010. Runner's Symposium. Pleasant Prairie, WI. United Hospital System. pp 2-3.